Stuart statue update: Break-down of the $75,000. 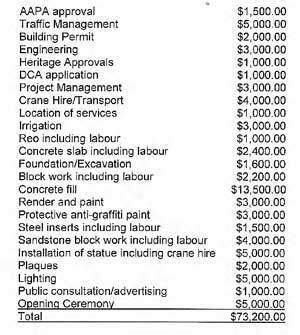 The Town Council has responded to doubts about the cost of $75,000 for the relocation of the controversial Stuart statue by releasing the break-down of the costs (pictured). Whose leg are they trying to pull with this pricing? If it is correct the council heavies should be sacked for accepting such idiotic prices! Some of these figures should be really looked at. $13500 for concrete fill, how big is this base? Is somebody really saying they paid $1000 per cubic meter, and they used 13 cubes? If less than 13 cubes, what price were they charged. $5000 for traffic management? $3000 for project management? Do our councillors look at how our money is being spent? No wonder our rates increase. Some of these items are listed at insane prices. Any elected member who thinks these prices are fair, and did not bear scrutiny, should be embarrassed to be on council. Councilors must ensure we get better value than this, what a disgrace. Why was $1500 paid to Aboriginal Areas Protection Authority. For approval. Another $1000 to heritage Red tape really is only there to line the palms of departments for nothing. A public statue should not have incurred these costs. The Libs have been saying that they will be removing the red tape that interferes with things being done. Where is the CLP voice here with this one? Well, if Kieran can view each of these invoices related to the above list (once paid) I would happily accept the above list!